Be the first to share your favorite memory, photo or story of Melonee. This memorial page is dedicated for family, friends and future generations to celebrate the life of their loved one. 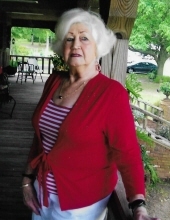 Melonee McRae Plummer, 78, of Escatawpa, MS passed away on Friday, February 8, 2019 in Ocean Springs, MS. She was born February 5, 1941 in Agricola, MS to the late Harold and Maudie McRae. She enjoyed gardening, working in her yard, and spending time with her family and friends. She was a member of Wade Baptist Church. Along with her parents, Melonee was preceded in death by her husband, David C. Plummer; and brothers, Douglas McRae and Johnny Rae McRae. She is survived by her sons, Keith (Teresa) Tanner, Ricki (Donna) Tanner, Nick Tanner, Larry (Paula) Breland, Brian (Becky) Plummer, and Ryan (Stephanie) Plummer; grandchildren, Taylor Fell, Nicole Dickerson, Kristen Havens, Bart Tanner, Holly Tanner, Stephanie Hougue, Kami Carter, Colton Tanner, Nicholus Tanner, Megan Thompkins, Dillon Breland, Dakota Breland, Justin Plummer, and Jordan Plummer; brother, J. R. McRae; sister-friends, Charlotte Howell and Linda McLendon; along with numerous great-grandchildren, nieces, nephews, and other relatives and friends. Visitation will be held on Monday, February 11, 2019 from 5 p.m. until 7 p.m. at Heritage Funeral Home in Moss Point, MS. Funeral service will be on Tuesday, February 12, 2019 at 10 a.m. in the funeral home chapel. Interment will immediately follow at Serene Memorial Gardens. Pallbearers will be Dillon Breland, Dakota Breland, Mike McRae, Russell McRae, Justin Plummer, and Dylan McRae. To send flowers or a remembrance gift to the family of Melonee McRae Plummer, please visit our Tribute Store. "Email Address" would like to share the life celebration of Melonee McRae Plummer. Click on the "link" to go to share a favorite memory or leave a condolence message for the family.